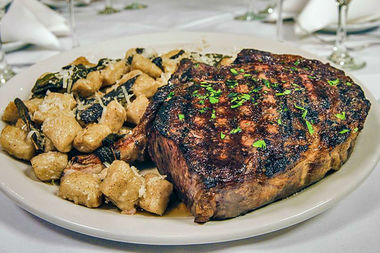 The giant ribeye and gnocchi at A Tavola is one of the off-menu dishes featured in the Travel Channel's new show, "Man Finds Food"
CHICAGO — Three neighborhood restaurants and one gin-focused bar will get their close-ups — finally — in the new Travel Channel show "Man Finds Food" hosted by Adam Richman. In the Chicago premiere, airing at 8 p.m. Wednesday, Richman visits the bar Scofflaw in Logan Square, Italian favorite A Tavola, hot dog stand Fatso's Last Stand in Ukrainian Village, and the Brazilian-influenced La Sirena Clandestina in the West Loop. The show originally was scheduled to premiere last summer, but was postponed after Richman went on a tirade on Instagram in response to criticism of his use of the hashtag "#thinspiration." He had posted the hashtag with a photo to show his recent weight loss. In "Man Finds Food," Richman seeks out off-the-menu dishes and gets the stories behind them from the chefs and restaurant owners. At Scofflaw, it's the gut-busting Guapachosa sandwich, layered with a bit of every dish on the menu. Richman calls it "one of the biggest, dankest, most awesome-looking sandwiches" he's seen. At Fatso's Last Stand (filmed when it was still called Phil's Last Stand), he samples the shoestring potato-topped shrimp po' boy. La Sirena Clandestina chef John Manion cooks Richman a platter of meat dubbed the Size Me Up, which includes sweetbreads, chicken hearts and short ribs. At A Tavola, chef Dan Bocik grills a 3-pound ribeye while revealing, to Richman's delight, the existence of a second kitchen in the basement. The steak comes with a generous helping of gnocchi and is called by those in the know, which is anyone who watches this episode, the Italian Meat and Potatoes.